Our group reformer classes are designed to challenge your body and provide a dynamic Pilates experience. No matter if it’s your first or 100th class, everyone leaves feeling better than when they walked in! During Reformer Pilates classes at our Perth studio, individuals complete dynamic Pilates exercises using our specialised Pilates machines called “Reformers”. Reformer Pilates offers an enhanced experience compared to mat-based Pilates as the exercise difficulty can be adjusted and refined much more accurately. By adjusting the exercise difficulty, the spring resistance and overall focus, classes can be appropriate for all ability levels from the extremely unfit and injured all the way to elite athletes. Classes using the reformers can be invaluable for pregnant women and new mothers. As one of the few Pilates studios in Perth to use reformers in a large group setting, we can offer members a complete full body workout, supervised and lead by extremely knowledgeable and experienced instructors for a reasonable cost. Our group reformer classes are programmed by Kristen, a Pilates professional with more than two decades of experience. Just like the rest of our team, Kristen works closely with you to achieve the best results possible. Kristen is a level 4 instructor, the highest Pilates recognition in Australia. Our group classes are limited to 12 people and reservations are required. A live schedule can be seen through our app, which can be downloaded from iTunes or Google Play. An endless variety of exercises, sequences and movements. honestly, you’ll never get bored! Improve your muscular endurance, strength and control. Find, engage and strengthen your bodies powerhouse, the core. Improver your co-ordination, your balance and your overall body control. Change how your body moves, how it feels and how it looks! Reduce stress, anxiety and spend a whole hour “in the moment”. Fantastic for mental balance and health. Every exercise can be modified to make it easier or more challenging for you, always catering to your ability level. With more than 30 classes a week, work out when it suits you, we even have an onsite crèche to supervise your young children while you enjoy class. Affordable and flexible class options or take out a membership, the smart way to get the most out of our reformer Pilates program. Are you ready to give it a try for yourself? For more information about reformer Pilates and group classes, get in touch and tell us about your needs. Contact The Pilates Klinik online or give us a call today. 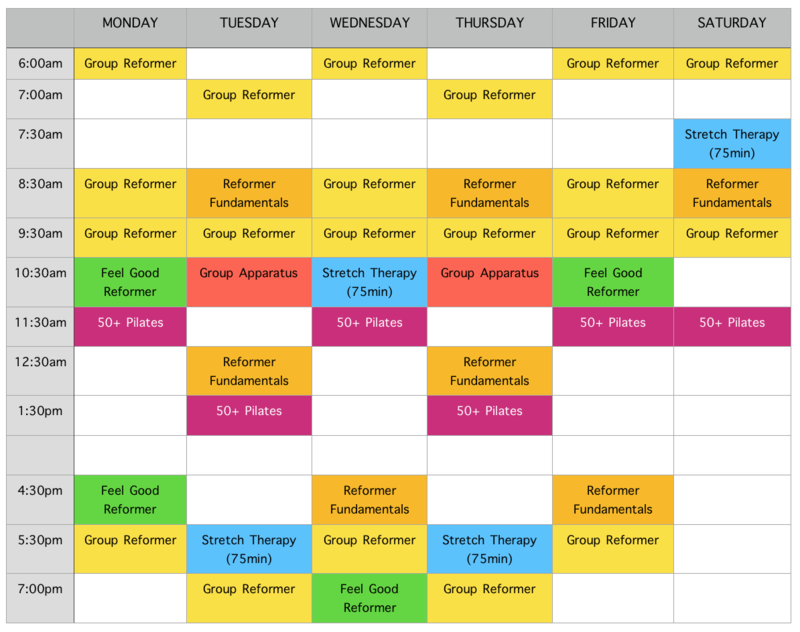 View our schedule below to find session times that fit into your life, clients love that they can pick and choose different classes depending on their week!